A client-side mod that adds several ways of moving items in inventory GUIs. This is done by scrolling the mouse wheel over item slots (optionally while holding some modifier keys) or by holding down modifier keys and then left- or right-click dragging over the slots. The mod has a few modifier keys (Shift, Ctrl and Ctrl + Shift) to move entire stacks, all matching items or all items. It also has special handling for Villagers to ease the annoying clicking around while trading. As of version 0.11.0, it also has special crafting inventory handling (with a 18-slot internal "recipe memory"). The basic item scrolling is similar to what NEI (and some other mods) also did/do. But I wanted more control and more ways to move items, so I made this mod to have all those modes that I find useful, in one distinct, client-side mod (so it also works on vanilla servers all the same). There are config options to individually enable or disable more or less any of the modes. There are also options to reverse the scroll directions, or to change what for example "scrolling up" means. All the configs are accessible via the in-game config menu. In the 1.13.2 Rift version, the default hotkey to open the in-game config GUI is I + C.
Mouse wheel scroll alone: Move one item at a time from or to the slot hovered over. Shift + scroll: Move matching, entire stacks. The stack hovered over is moved last. Ctrl + scroll: Move all matching stacks to or from the other inventory. Ctrl + shift + scroll: Move everything to or from the other inventory. Shift + left click and hold + drag: Move all the stacks that are dragged over. Shift + right click and hold + drag: Move all but the last item from all the stacks that are dragged over. Ctrl + left or right click and hold + drag: Move only one item from all the stacks that are dragged over. Shift + click on an empty slot with items in the cursor: Move all matching items to that inventory. Shift + click outside the inventory with items in the cursor: Drop all matching items from the entire inventory. W/S + Shift/Control + click (and drag): Move items up (W) or down (S) in the inventory. Note: Before version 0.6.1, the Shift + right click and hold + drag functionality required one empty slot in the source inventory for an intermediate click action. Villager GUI has special handling (if enabled in the configs). It is only used when you hover over the output slot. So basically you can just hold shift and scroll down/up repeatedly to trade items fast & easy. Starting from version 0.11.0, there is support for crafting grid re-filling and mass crafting of items. Alternatively, while hovering over an output slot with a craft result item, you can press Shift + the Recipe key + a number key to store the recipe to the slot by that number (slots 1 to 9 only). NOTE: This feature is actually in no way tied to crafting grids/tables. All the to-be-supported crafting grids must be added to the configuration. The vanilla crafting grids, plus all the crafting grids from Ender Utilities have been added there by default (and thus also serve as examples of how the config should look like). To find out the GUI class name, the output slot class name and the slot numbers for the output slot and the ingredient slots, you can use the debug key combination Ctrl + Alt + Shift + I. To get the GUI class name, press it while not hovering over any slots. To get the output slot's class and slotNumber, press it while hovering over the output slot. And then also get the ingredient slot range by pressing it while over the first and last slots for the grid. All the output will be printed to the console. NOTE: In the output, you want the slotNumber value, not the getSlotIndex() value. All the crafting inventories that should be supported, must be added to the scrollableCraftingGrids configuration value. Note that you must NOT use any spaces in it, or otherwise the regex won't match. Slot and GUI blacklisting was added in version 0.10.0. By default the ME Terminal slots from Applied Energistics 2, and the Crafting Station side inventory slots from Tinkers' Construct are blacklisted. You can blacklist problematic slots or entire GUIs via the in-game config menu (the blackListedSlots and the blackListedGuis options). To find out the required class name to add to the blacklist, use the debug key combination Ctrl + Alt + Shift + I while hovering over a slot to get information about the slot, or while NOT hovering over a slot to see the GUI class name. Alternatively, (as of 0.9.0) you can also simply toggle ON/OFF Item Scroller as-needed while inside a GUI, by pressing the toggle key, (which is Ctrl + S by default, can be configured in the Controls menu). The ON/OFF status is retained for as long as the game is running. There are two different noteblock sounds to indicate what the status changed to: the higher-pitch pling when enabling, and the lower-pitch bass when disabling. The option useSlotPositionAwareScrollDirection (added in 0.7.0) changes the behaviour of the the scrolling direction so that it tries to detect if the "other inventory" on the screen is above or below the slot that is being scrolled over. The scroll direction will then be "scroll up to move to the inventory above, scroll down to move to the inventory below" instead of the normal "scroll up to move to the other inventory, scroll down to move to this slot/inventory". The reverse scroll direction options will also be applied on top of it still. All the item moving in this mod is done by emulating mouse clicks on the slots. Note: Some other mods also add the same functionality. You don't want to have multiple mods installed and doing this at the same time. 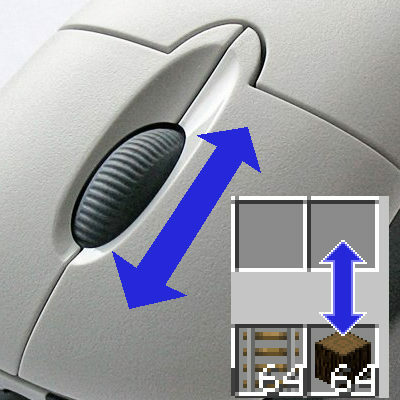 Mods that add the single item scrolling functionality in Minecraft 1.8.9+, that I know about: Mouse Tweaks, Inventory Sorter. So make sure you don't have the (single item) scroll functionality enabled in more than one mod at a time. Note: This is a client-side-only mod! Can you re-word that, or post a video clip or screenshot or something, as I didn't really understand what you mean...? Is this compatible with mouse tweaks? It should be, you just need to disable all the overlapping features in one of the mods to avoid weird glitchy behavior where both mods try to do the same thing. But for the most part there shouldn't be the need to use both... Item Scroller should do more or less everything Mouse Tweaks does, plus a bunch of other things, although it doesn't do the same kind of dragging things, because personally I didn't like how they work and how they change vanilla behavior. I'd like to translate this mod gui. I only found a few contents in lang file. How can I change language for this mod? There really isn't that much to translate. The only text this mod has are basically the hotkeys and config options in the config GUI. And it does look like I haven't really added translation keys for those... I should probably update all my mods by adding translatable config comments. Which version of this mod do you primarily want to translate? The Forge version, the LiteLoader version or the Rift version? I want translate Rift version for 1.13.2.
am I missing something or is there no way to open the config gui in the rift version? The in-game config GUI should open by default with I + C in the Rift version. How do i install the mod. There is no Liteloader for 1.13.2.
okay this is gunna sound really weird.. but... for some reason the mod isn't loading... like, its in the mods folder, I'm using (the latest version of) forge (2796), I checked my mods folder, alongside the loaded mod list, and it's not there... I can't delete it from my mods folder while the game is running (so it's kinda loaded? ), but there's no keybind options in the config. Scroll wheel doesn't work, none of the usual keybind don't work (s, mouse wheel). I feel stunted playing without this, that and I miss my shift + left click to quick move items that I drag over... what's going on man?! Which version of the mod did you download/install? If you are using Forge on MC 1.12.2, then make sure not to download the latest file that is for the Rift loader on MC 1.13.2. Currently the latest version for Forge on 1.12.2 is itemscroller-1.12.2-0.12.0.jar. That's what happened. My solution to the issue, make the "rift loader" version of the mod a beta branch, as most people (admitedly this happened to me because I was being a bit lazy" will just click "download", where as I actually clicked on the file link (I like to look at changelogs and pretend I know what they mean), I failed to notice that the filename was for 1.13, and not 12.
woops, I guess I was just bieng blind as well, I literally scrolled up and saw that it was a version under the 1.13 tag XD. NVM! When using 1.13.2-0.14.2, shift-clicking an item in your inventory at the same time that you close your inventory causes the player to hold crouch. Also, I was just wondering whether you would consider adding multiple page support for the crafting recipes? the server I play on has tons of custom recipes (which don't show up in recipe book ofc) so I really want to have them on stand-by instead of re-adding them everytime I need them.